It’s that time of year again, time for NYC’s hippies, city-dwellers, and families to get out of the city and spend a weekend on the Hudson River listening to folk musicians, storytelling, and attending dance and educational seminars. The Clearwater Festival officially began back in 1978 and its roots can be found in the environmental activism of Pete Seeger. In the 1950’s, Seeger, in an effort to clean up the Hudson River, played a multitude of concerts along the river and collected money for the cleanup. 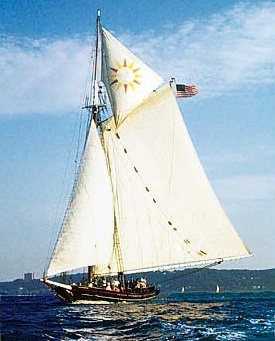 Eventually he was able to purchase a sloop which he appropriately named the Clearwater. The ship itself is currently used as an education vessel, teaching students and teachers about environmentalism and ecology. Those original small concerts that Seeger started in the 50’s then became the massive gathering that is the Clearwater Festival. Did I mention the stages run on sustainable bio-diesel?! The festival itself boasts performances by folk musicians from around the world. This year’s lineup includes names such as Mavis Staple, Hot Tuna, Kris Kristofferson, and even Pete Seeger himself. Musicians such as Bruce Springsteen, Ani DiFranco, John Mellencamp, and Dave Matthews have also played the festival in the past. It’s not only about the music, however. Festival-goers can enjoy educational activities, dance shows, activism booths, artisanal food, arts and crafts, as well as a food court. You can even take a tour and/or a ride on the Clearwater! The Clearwater Festival offers the perfect excuse to get away from the city (like camping!) for some fresh air and enjoying the outdoors, music, green activism, and education. DIRECTIONS: Metro North Hudson Line to Croton-Harmon Station. Free Shuttles to park provided!